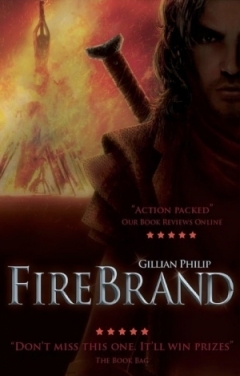 The other day I got to interview Gillian Philip, author of one of my favorite new novels, Firebrand. I got talking on twitter with Seth MacGregor (the main character of Firebrand), and managed to convince him to answer a few interview questions too. He claims Gillian doesn’t let him have any fun, but he has got a weakness for twitter, Joss Whedon TV shows, modern conveniences, and finding trouble. If you’re already a fan of Firebrand, go harass Seth on twitter. If not, learn what all the fuss is about by reading my interview with Gillian Philip, or my reaction to the book. Hi Andrea! Oh, Gillian’s such a control freak. At least she’d like to be, and she thinks she has a say in anything I do. Ha. Given what she puts me through, I think I deserve a bit of fun. And thank you for interviewing me. She-Who-Would-Like-To-Be-Obeyed has tried to make me promise I won’t flirt, but hey, I have given no oath, and all that. Unlike many other Sithe, you can actually physically feel the veil, you can pull it and pinch it, hold it between your fingers. What does it feel like? you wouldn’t um, do anything to harm it, would you? I’m absolutely not supposed to be able to do that, so this is between you and me, okay? I mean, the Sithe don’t burn witches, and they have a healthy respect for them, but… they tend not to be all that fond of them. So anyway, yes, I can feel the veil. It’s kind of… elusive. Sometimes it feels like very, very fine silk; sometimes it’s so fragile it’s more like mist. Or like mist would be if you could touch it, if that makes sense. It isn’t visible. And no, I wouldn’t harm it even if I could. It’s too valuable as a defense. I am tempted to tweak it a little, just occasionally; like, say, if a gorgeous full-mortal blogger is asking me questions and I want to hold her attention. But I can’t damage it, or tear it. There’s no-one on earth who can do that, even if the blasted thing is dying all by itself. Can you tell me more about your water-horse? the first time you met it (her? him?) was one of my favorite scenes in Firebrand. Ah, thank you! That is one of my favourite memories, I’ve got to say. I think I fell in love with that kelpie before I’d even seen it. It’s pretty hard to master a water-horse; once you get on one you can’t get off, and they’ll only answer to the right bridle and the right mind, so I was kind of proud I didn’t get killed. My blue roan isn’t exactly Champion the Wonder Horse; if he found a kid in trouble he’d probably eat it instead of going for help. He’s voracious and he’s violent – great in a fight – and he can be fickle. He’s not as obedient as Conal’s horse, and I wouldn’t trust him with puppies or small children. But he’s loyal to the death and I love him.